Long, long ago animals had no tails. One morning when Elephant was drinking at Mangochi with his friends, it was very hot, and the flies were bothering them. “Across the valley, and over the hill lives Kudu who has boxes full of all sorts of things. Perhaps one of them is full of tails,” answered Eland. So Elephant lumbered off across the valley and over the hill to where Kudu always browsed. Kudu looked at his visitor. “I’m not sure,” he answered. “But look through one of those boxes, Elephant,” he said. 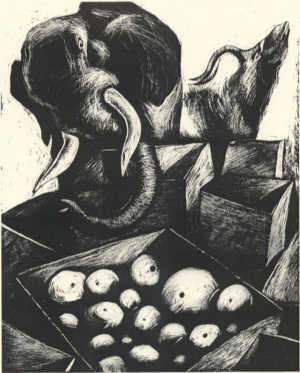 “Perhaps tails are packed away in it.” Elephant lifted the lid of a box with his trunk and peered inside. All he saw were dozens of beads, all made of glass. “But we want tails, and I have no glass beads to offer you Kudu,” said Elephant. “Thank you for your trouble,” said Elephant. “The next time I see you I will have glass beads for you,” and he flapped his ears and walked back over the hill and down the valley to Mangochi. When he got to the waterhole, the animals crowded around him. “Animals usually pay Kudu in glass beads for any favour that he does for them. But as I had no beads he said it did not matter, and he told me to say…er, he said I should say… Oh no! I have forgotten the words that will get us tails! I am sorry,” said Elephant, “but I cannot remember them. It is very strange, because an elephant never forgets!” And Elephant flapped his ears and rolled over in the mud to cool off after his long journey. Then Eland said that he would go and ask Kudu if he could look through a box for tails, and if there were none, for the magic words that would give the animals tails. “After all, Kudu may like a visit from one of his own kind,” he said. And off he ran, fleet of foot. But he same thing happened. There were only glass beads in the box, and of course Eland had also not brought any beads with him. But Kudu gave him the magic words “Tibibibi” anyway. And strangely enough, by the time Eland got back to Mangochi, he had, just like Elephant, forgotten them. Then Leopard went to see Kudu to ask for tails from a box, and when he found only glass beads, he asked for the magic words that would give the animals tails. But of course, by the time he got back to Mangochi, he too had forgotten the magic words, “Tibibibi”. Then Tortoise spoke up. “I think that Kudu is a very clever animal,” he said. “It is time for me to visit him with some glass beads. Perhaps if he receives payment for his advice, we will have our tails. I will take a little longer than Elephant and Eland and Leopard to get to him. But I may just be lucky and remember the magic words that he gives me when I get back to Mangochi. Goodbye friends. Wish me luck!” And Tortoise crept off slowly to the village to collect glass beads from the market place that lay where the sellers had dropped them. When he had found five glass beads he wrapped them in a leaf and tucked them up in his shell. Then he set off to see Kudu. After many days of travelling he found Kudu resting under his kachere tree, surrounded by his boxes. “Oh, yes please,” answered Kudu, and he came bounding up to Tortoise. Tortoise unwrapped the beads and spread them out at Kudu’s hooves. There was a bright green bead the colour of a baobab leaf. There was a blue bead the colour of the sky, and an orange bead the colour of fire. There was a bead as yellow as the sun, and one as black as a night without stars. Kudu was enchanted. “Is there anything I can do for you to thank you for this gift?” he asked. 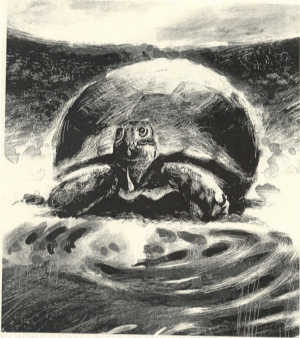 “Thank you,” answered Tortoise, and he crept slowly off, back towards Mangochi. for w e e k s and w e e k s. So when they saw the exhausted little creature come slowly and quietly up to the waterhole to slake his thirst, a great cheer went up from them. “Hello, dear Tortoise,” they laughed. “We have missed you. It is good to see you back home even through you too have no doubt forgotten the magic words that Kudu gave you to get us tails to chase away the flies.” Tortoise finished dinking his water, and then slowly looked around him. “It is good to be back home, my friends. Tibibibi! May all of us have tails!” And with those words every animal looked behind him and saw that he had a tail. Tortoise looked over at Elephant, who was trumpeting with pleasure and swishing his tail back and forth. Then Tortoise looked for his own tail. He noted that it was one of the smallest tails of all the animals. In fact it was hardly a tail to speak of. It was then that he realised that every animal had a tail to suit him. He himself was well protected by his shell, so that the flies didn’t bother him. And he certainly didn’t wish to drag a big tail along in the dust behind him. His tail was just right. He looked around him at the animals and their new tails. “And now that we are all satisfied, I must sleep awhile, as I am very tired,” he murmured. “Thank you, Tortoise,” cheered all the animals. “Thank you for getting us tails!” Then Elephant lifted the tired little creature up on his trunk and placed him in a shady spot under the kachere tree, so that he could rest inside his shell after his long and tiring journey. 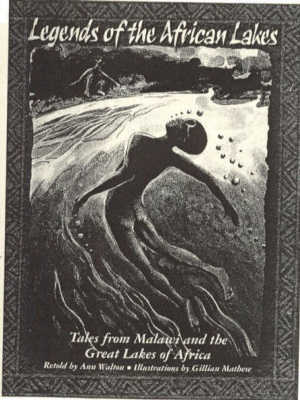 This story is from Legends of the African Lakes, Tales from Malawi and the Great Lakes of Africa, retold by Ann Walton with colour and black and white illustrations by Gillian Mathew. The book is published by Central Africana Limited and is available from the Central Africana bookshop/gallery in Blantyre or from any other bookshops in Malawi at MK750.